Just a few days to go . . . let the TRiumphs shine! Same rules as normal but for those that are new to the club here they are again and I hope to see a great turn out at Semaphore on the 12th November this year. • Entry will not be permitted to those joining/renewing on the day. • The car must be currently registered (with the exception of Competition and Restoration cars). • Late entries, i.e. cars arriving after the published judging commencement time, will not be eligible. • All cars must be driven onto the judging site (except competition vehicles which may be trailered). • Entrants must score a minimum of 70% of the total points available in presentation section to be eligible for a Class or Outright trophy. • Classes may be split/combined depending on the number of entrants in each Class. This will be determined by DOT Officials on the day. • Cars will NOT be judged on originality except in the event of a tie when the cars will be marked out of 250 points in accordance with the Concour table. • In the event of a tie “originality” for each model shall be broadly determined as any equipment or manufacturing (i.e. official works modifications) produced by the original car manufacturer or an approved option available for that model. • Cars that win their Class for 3 years running, or win outright for 2 years running, will be placed in a Masters Class and are ineligible to enter the standard Concours Classes for 2 years. Masters Class Awards will be given to all Masters Class cars in attendance. • Trophies will be awarded to 1st, 2nd and 3rd Overall place getters on the day. 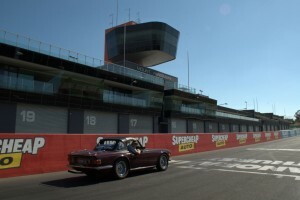 • The Register Trophy (TR2/3/3A and 3B), The Michelotti Trophy (TR4/4A/5) and The Harris Mann Trophy (TR7/8), will be awarded to the highest points achieved in that Class. Where the winner is also the winner of a Concours Class only one personal trophy will be awarded. • Trophies will be awarded to 1st place only if 3 or fewer cars are entered in a Class and 1st and 2nd place if 4 or more cars are entered. • Judging will follow the processes outlined in the Concours section, except the underside will not be considered. • Standard classes will be – TR2/3/3A/3B, TR4/4A/5, TR6, TR7/8, Stag, Saloon, Dolomite, Spitfire/GT6, Herald/Vitesse, Pre-54, and competition. • Restoration projects may be considered depending on what is presented on the day. • Classes may be split/combined depending on the number of entrants in each Class – to be determined by DOT Officials on the day. • Masters Class cars are ineligible to enter POO section until 2 years after their Masters Class qualification. • Trophies will be awarded to Class winners only. This entry was posted on Monday, October 2nd, 2017 at 20:09	and is filed under Concours. You can follow any responses to this entry through the RSS 2.0 feed. You can skip to the end and leave a response. Pinging is currently not allowed. Looking forward to the new venue. Happy to judge the undersides of Concourse entries if you need a volunteer.